Do your students need support in setting up and solving proportions? 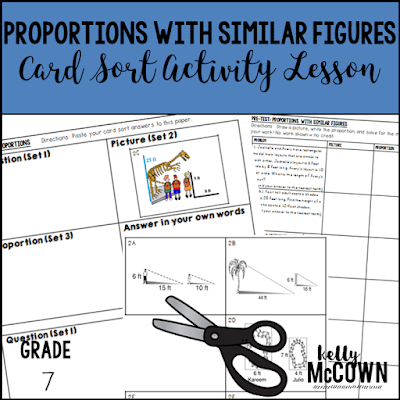 This Card Sort Activity lesson is designed to give students scaffolded support in reading a word problem, writing a proportion, and solving the proportion. Students will make connections with proportions and become fluent at setting up proportions. "A great resource! Thanks we really needed this extra practice!" "Nice questions! Very thoughtful and all types." "I have such limited experience with 7th grade standards, so this resource was helpful for me to get started and engage students in the content! Thank you for creating this!" Students can be successful with this activity and show learning gains on the post assessment. This can be used for data collection or grading. Students will understand how to write and solve proportions and feel successful in the process.